These are the lavender rose of Sharon in my world besides the white ones! They are all gone now as the weather has been cold, gloomy, and rainy. I caught the moon on clear nights when the need for fresh air called to me. They are not the best, but I like the color so I kept them. It is getting rarer to see the moon at night now or to find flowers that are still blooming. Season changes, the earth changes, and we must adapt. Do you know that squirrels love to eat these roses of Sharon? I watched them with my own eyes, and couldn't believe it. They nibbled on fresh young flowers and seemed to enjoyed eating them. Wish you all a great new week! Brilliant collage! I love the color of this Rose of Sharon, and its contrasting center. The moon mde a very nice addition. with us the hibiscus has finished flowering some time. Gorgeous flower and color and an awesome moon!! Terrific caputes and a great mosaic for the day!! Hope you have a wonderful week!! Very pretty mosaic, the colors are lovely! A great mosaic! I wondered what was munching on my Rose of Sharon bushes! I can believe the squirrels eat them because I do and my friend's dog does! Such a pretty collage. 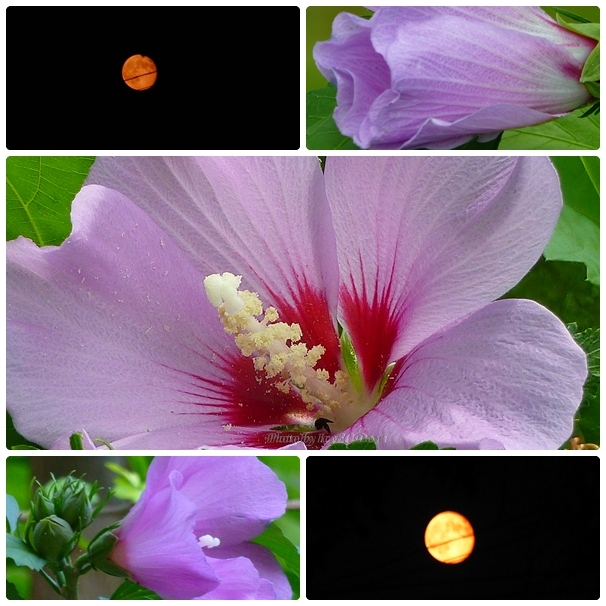 Beautiful collage of the moon and flower! your mosaic always make me awe in delight Icy, so very beautiful and captivating.